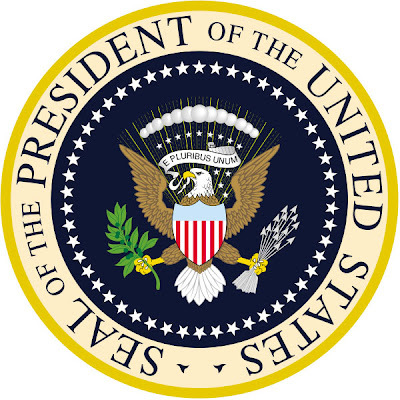 Note: I am working on Part 11 of my Complete History of The Rolex President series, and I thought I would share this fascinating preview with you. Once I officially complete this chapter I will remove this note. Part 11 of The History Of The Rolex President series, focuses on exploring origin of the term The Rolex President, and part 12 will focus on the evolution of the Rolex Day-Date models. 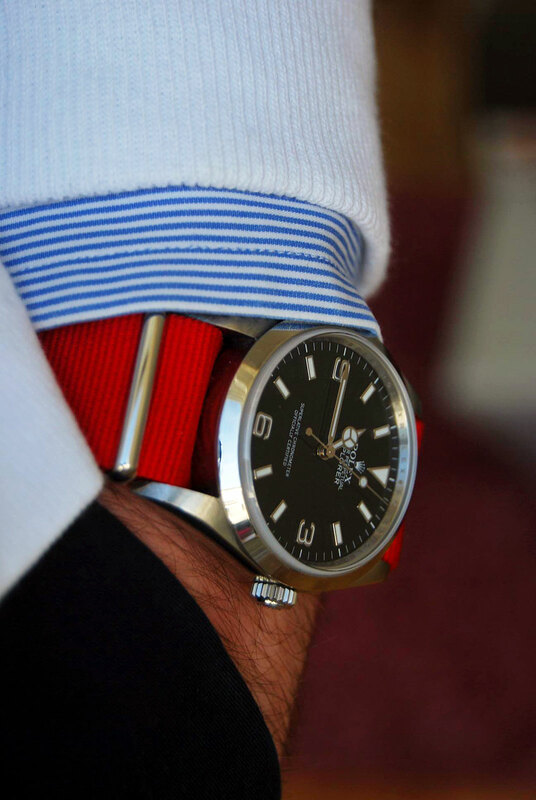 Have you ever wondered where the term The Rolex President came from? It has taken me many years to finally solve the mystery of how, when and where exactly the name The Rolex President came from. The Rolex President Watch for many decades has symbolized and been equated with being The International Mark Of Success and Achievement. I think I love vintage Rolex magazine ads as much as I love vintage Rolex watches. 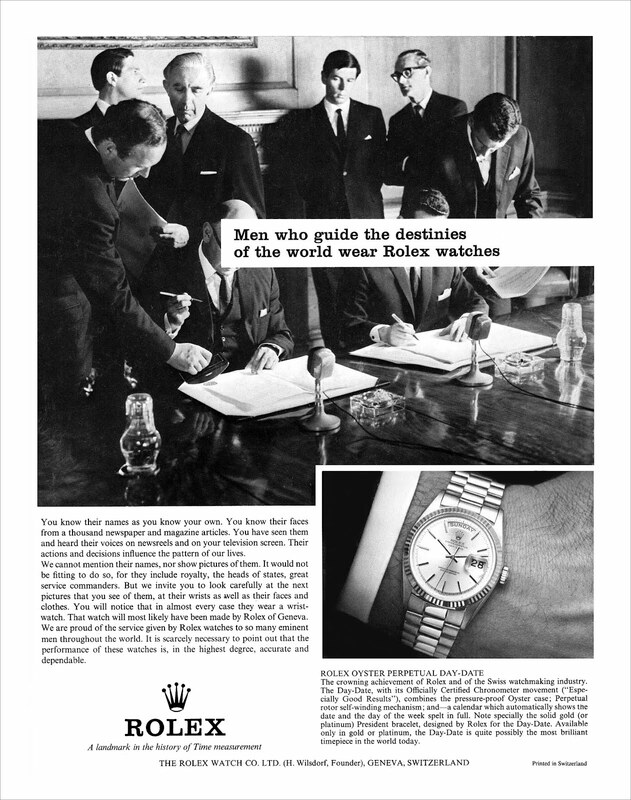 Historically, Rolex tends to run themed ads for long periods of time, and one of the most remarkable is the "Men Who Guide The Destinies Of The World Wear Rolex Watches" which ran from 1956, during the Dwight Eisenhower Presidential administration, through the Lyndon Johnson administration. This particular magazine ad ads another dimension or piece of the puzzle to The Complete History Of The Rolex President. 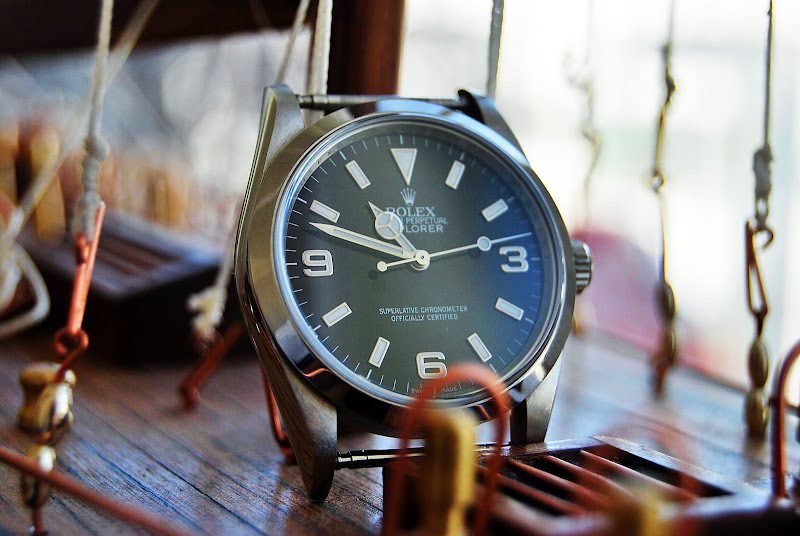 In particular, it is fascinating to see how much Rolex went out of their way to prove themselves 50 years ago. 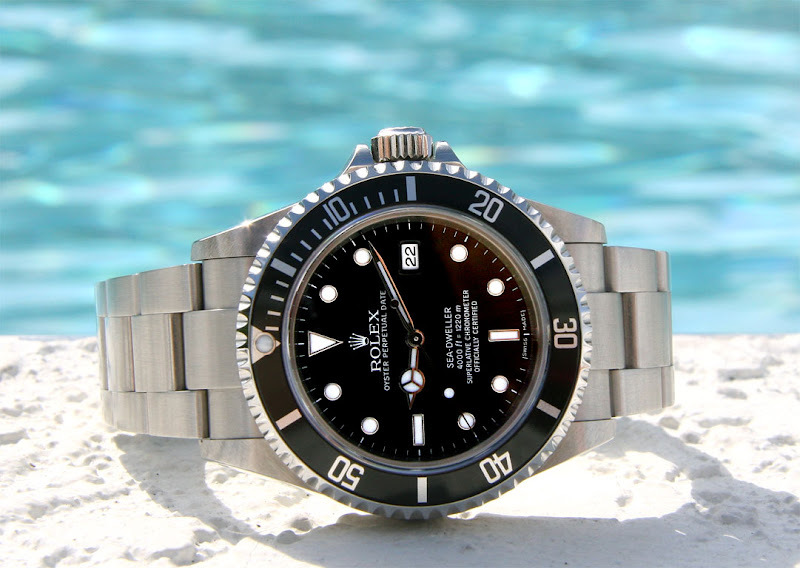 Today, Rolex has little to prove, since they have successfully become the international mark of success, but learning how Rolex achieved this is just fascinating. I scanned and restored this vintage Rolex ad, but the page had no date on it. So how do I know it is from the mid 1960s? 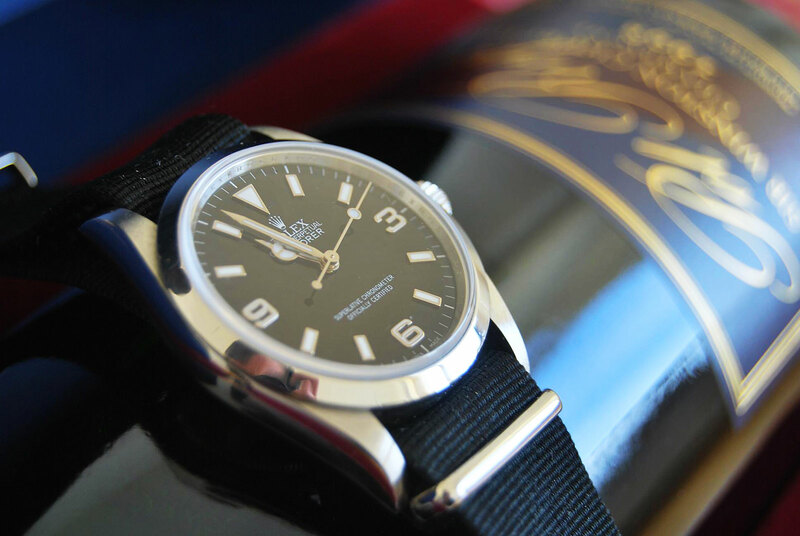 For one, the Rolex Day-Date pictured is a more modern model, and in the description under the photo, Rolex refers to the "President bracelet, designed by Rolex for the Day-Date." To the best of my knowledge, Rolex first began referring to the the Day-Date bracelet in 1965, which was a year after U.S. President, Lyndon Johnson began wearing what became his trademark yellow gold Rolex. 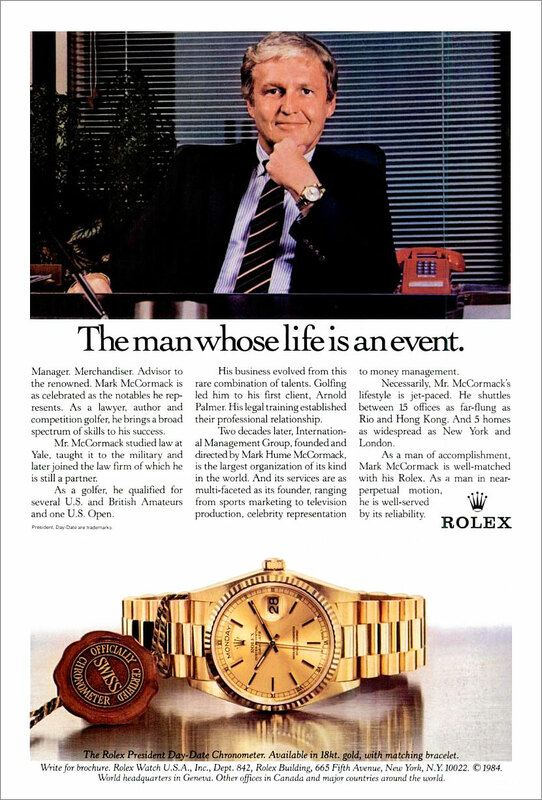 Speaking of Rolex ads with men wearing a Rolex Day-Date with a Red telephone in their office, if you scroll down the page to the Mark McCormack Rolex ad from 1986, you will notice he also has a Red phone, except his is push button instead of a dial phone like the one in the picture below. A supreme irony is that if Rolex made this ad today the man in the ad would have an iPhone 4s in his hand. Part of the irony in this is that in the last 45 years since this ad was published, telephone technology has changed radically, and Rolex still makes this exact same model, and it looks identical–talk about timeless design!!! 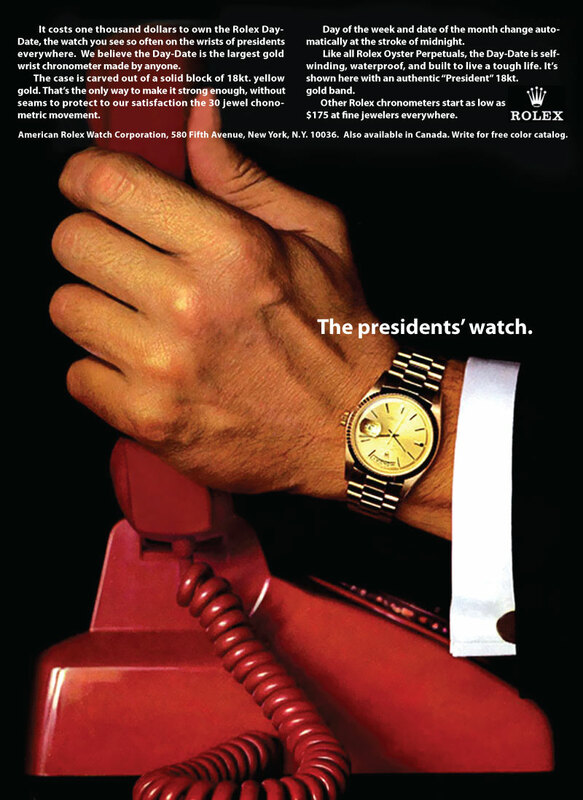 The 1966 Rolex Day-Date ad above has a headline that reads "The presidents' watch." 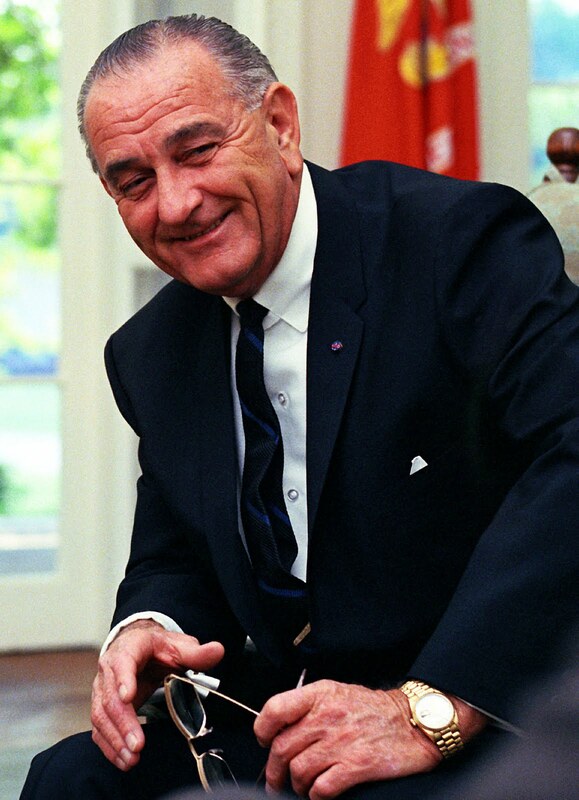 In 1965, just after U.S. President Lyndon Johnson had a gaul-bladder operation, he emerged and showed the press his scars, and there he was wearing his now trademark yellow gold Rolex Day-Date and he wore it very proudly. 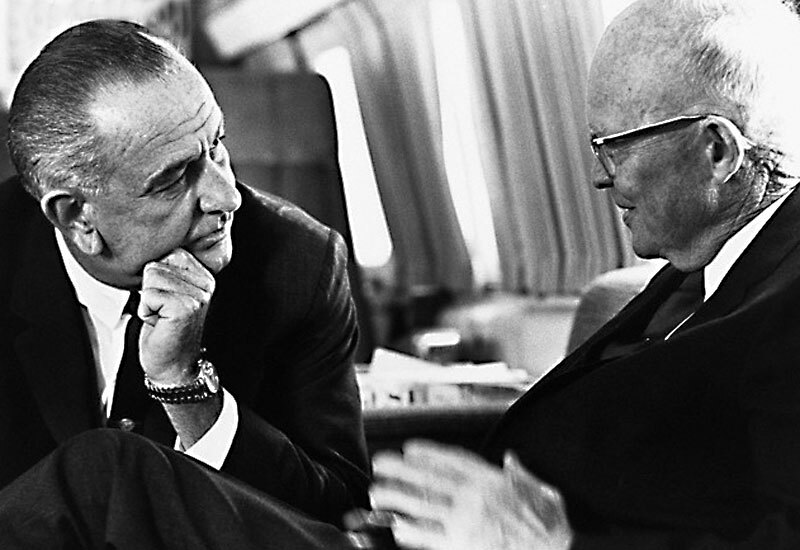 Lyndon Johnson was the second U.S. President to wear a modern Rolex, and the first to wear a Day-Date, with a Rolex "President" bracelet. 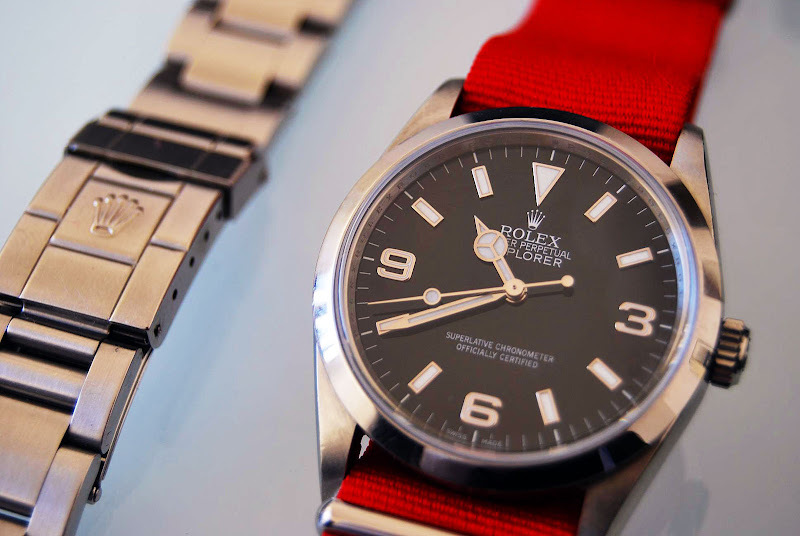 It has always been put forth that Rolex began referring to the bracelet on the Rolex Day-Date, as "The President" bracelet (around 1966) but never referred to the the actual Day-Date as The Rolex President. It was believed that people just started refering to the Rolex Day-Date as The President, but that Rolex never specifically referred to it as such. Wow!!!!! Rolex appears to have briefly referred to the watch as The Rolex President, then they stopped, and went back to calling it just The Day-Date, but the term "The Rolex President" stuck, and once the cat was out of the bag, that was it!!!!! Another fascinating Rolex mystery solved!!!!!! 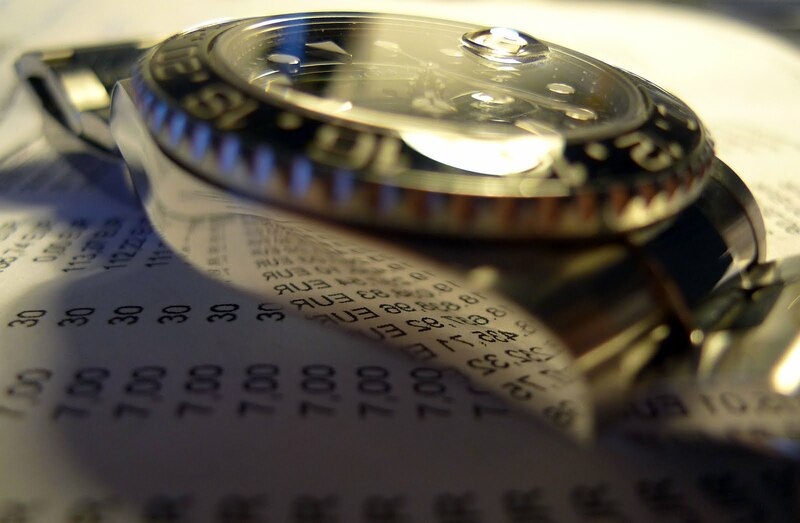 I am a huge fan of your Jake's Rolex World blog and read it almost daily. I was just working my way through some paperwork and I saw this reflection on the side of my GMTIIC and wanted to share it with you. I have no idea why, but of some reason when I look at Leon's amazing photo, the 1980s ABC song, "How To Be A Millionare" starts playing in my head!?!? 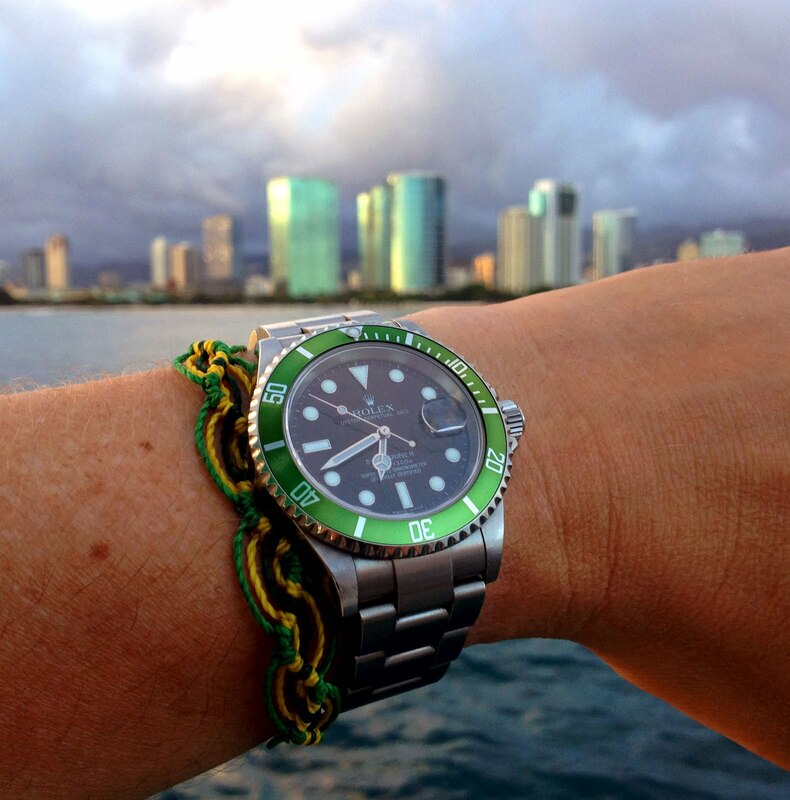 I took this photo of my favorite Rolex, which is an original LV Submariner, while sailing around Waikiki Beach on Oahu Island in Hawaii as the sun was setting over the Pacific Ocean. I remember when I took this photo, thinking it was really cool how the green on the LV bezel looked similar to the glass buildings in the background. For some reason, I was just talking with my girlfriend on the phone, and I said "Tell me about your childhood?" She asked me what I was talking about? I mentioned I was imitating the 7up commercial dude from the 1970s. Of course that made visit YouTube to find the commercial, and for those of you old enough to remember Geoffrey Holder who was the face of 7up in the 70s and 80s, all I have to say is "7up is the Uncola!!!! Ah, ha, ha, ha, ha, ha.!!!!" BTW Geoffrey Holder played Baron Samedi, the voodoo guru in the James Bond film, Live and Let Die, with Roger Moore playing 007. Come to think of it, Geoffrey Holder kind of laughs like the Count from Sesame Street!?!? I Googled "Tell me about your childhood" and realized in was also in the opening line to the song "Hyperactive" by Thomas Dolby. 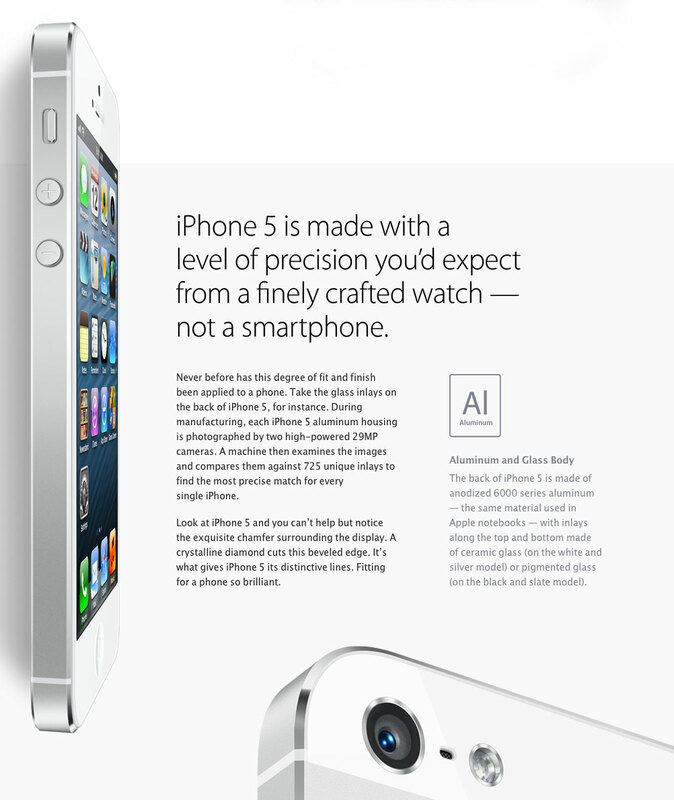 "iPhone 5 is made with a level of precision you'd expect from a finely crafted watch–not a smartphone." This is really profound if you think about it, but I have a question for Apple design. Why is the iPhone 5 not waterproof? It would be so simple for them make it waterproof like a Rolex Oyster. It seems like a natural evolutionary step. Any quality watch made today is waterproof, and I say it is time for the iPhone to be waterproof as well. Maybe Apple with make the iPhone 6 waterproof. Even though I publish Jake's Rolex World, I am the CEO and designer at BulletTrain.com and I have been working on developing a revolutionary BulletTrain case for the iPhone 4/4s and iPhone 5, which we plan to launch in mid November, so I have become extremely familiar with the iPhone engineering. It is fascinating to note the iPhone 5 camera lens now incorporates synthetic sapphire crystal for its lens on the rear camera to make it scratch proof, just like a Rolex. I am really excited for the iPhone 5 because I believe it is the first iPhone/Smartphone to truly deliver on the promise of being able to carry a world-class computer in your pocket. 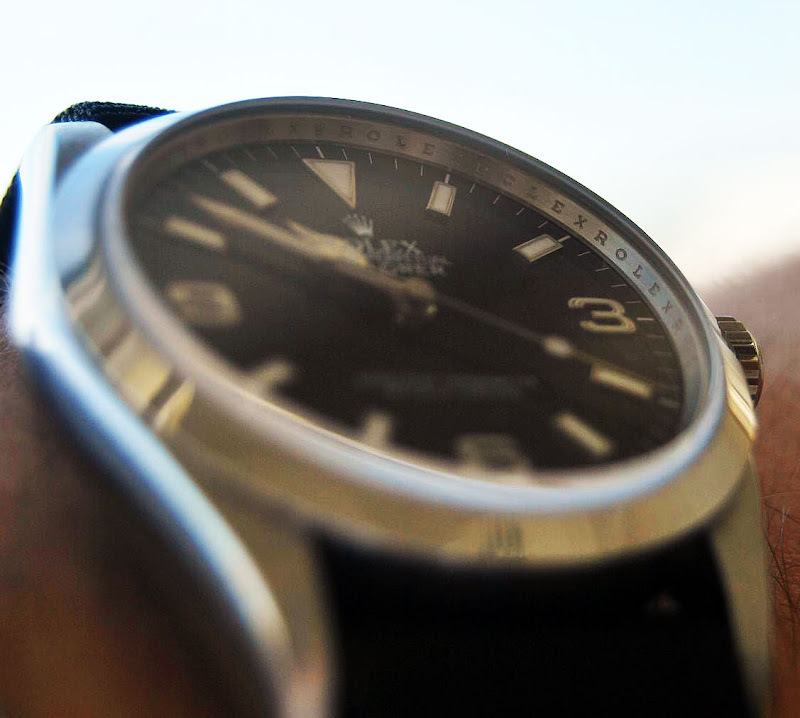 Many people have predicted the demise of the wristwatch, saying things like "Who needs a watch, I just check the time on my phone", but the reality is that with a watch, you just glance at your wrist and you know what time it is, which is so much more efficient than having to reach in your pocket and having to turn on your phone every time you want to see what time it is. 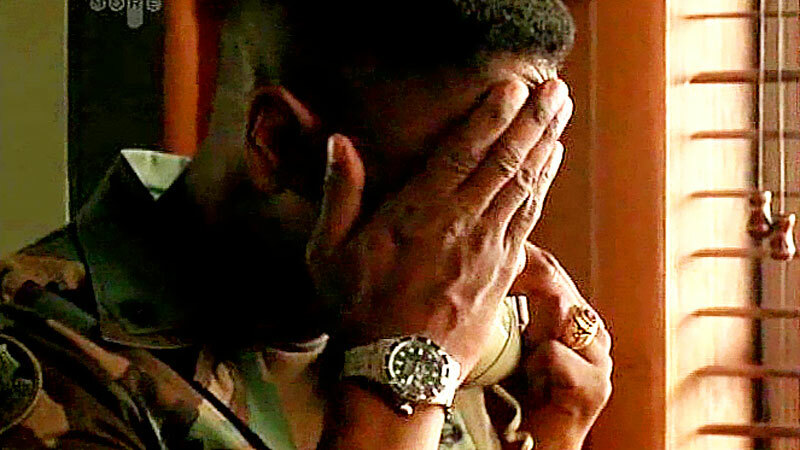 Also, I have noticed many younger people wearing wristwatches lately. Hope you are well. I came across your blog about a year ago, and have been a huge fan of it ever since. I was just cleaning up the contents of my Mac, and found these photos which I've taken at Sentosa, Singapore, sometime back. I was waiting at the holding room, prior to entering an island attraction called the Merlion. 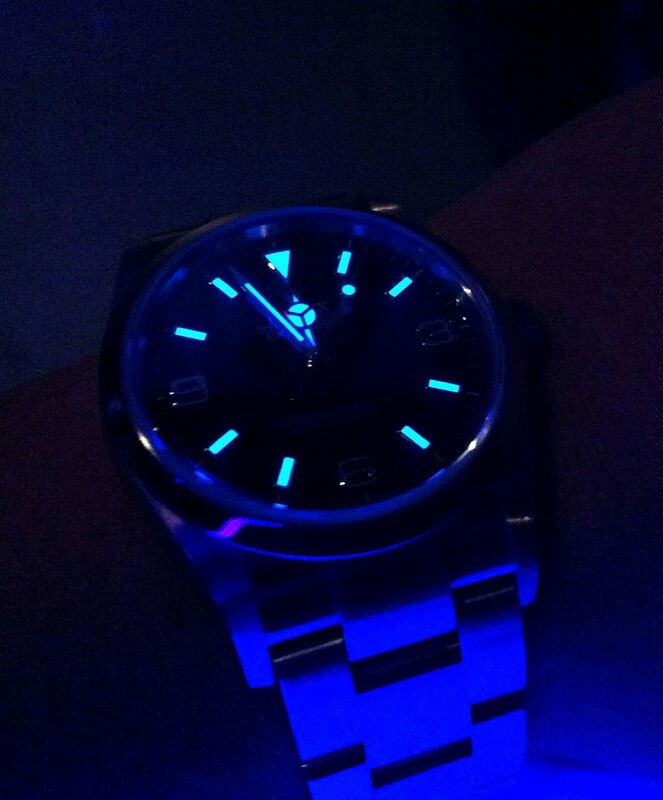 While checking the time, I discovered the lume of my Explorer seemed extraordinarily bright. So, I took several pictures with my IPhone, and was totally amazed by them. 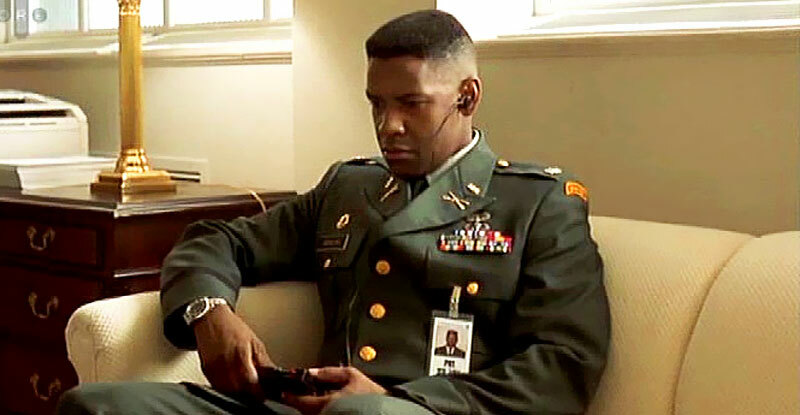 My pal James, from WatchesInMovies.info just sent me a message to let me know he just put up a post with images of Denzel Washington sporting a stainless steel Rolex Submariner from the 1996 movie, Courage Under Fine. 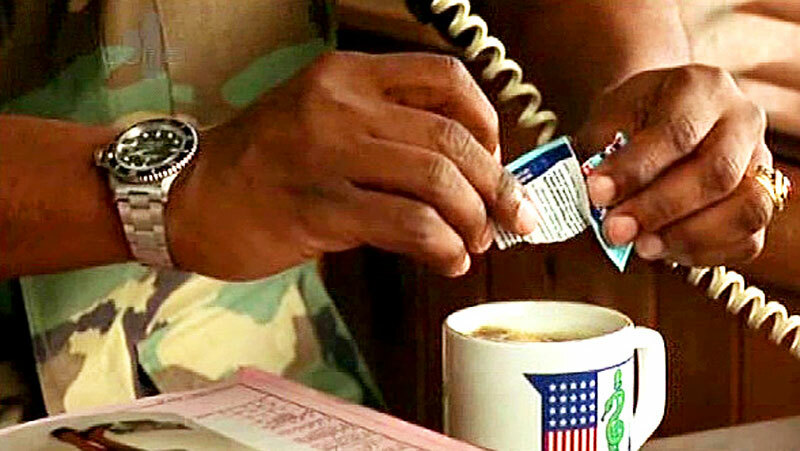 It appears, in the photo above and below, that Denzel Washington's Rolex Submariner is suffering from the same "Pulled Winding Crown" syndrome as Robert Redford's stainless steel Rolex from the 1976 movie All The Presidents Men!! !